The bar area. Photo: Dana Massey-Todd. © tablehopper.com. 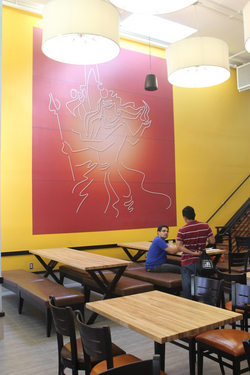 Line drawing of Shiva, and two communal or group tables. Photo: Dana Massey-Todd. © tablehopper.com. A report from Dana Massey-Todd: As previously mentioned on tablehopper, the large vacant space at 680 Valencia has become ~AMBER DHARA~, from Vijay Bist of Amber India. They are now open for dinner, and brunch on weekends is coming soon. I had the chance to stop by and chat with Mr. Bist and his staff this week. There is a lot to take in here. First of all, the space is truly enormous. It seats 175 people, with room for an additional 50 boozehounds at the bar and lounge. An upstairs area will be available for private parties or, on busy nights, regular folks. All of the design was done in-house by Mr. Bist and his team. The décor is sleek and, by necessity, on a large scale. 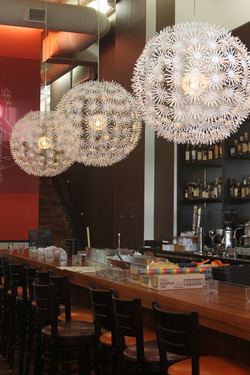 The bar is long, the ceilings are high, and the lighting is modern. There are two huge, colorful line drawings on the walls, by a Mumbai artist who prefers to remain anonymous (how mysterious!). The Hindu god Shiva graces one wall, and on the opposite wall is the goddess Lakshmi. Over the bar hangs a large television that will show Bollywood films, classic Indian Westerns, and other gems from Indian cinema. Both the bar and the dining room should be excellent for larger groups, as there is plenty of room for everyone, and the space has been designed to accommodate large parties without too much fuss. The innovative menu, by chef Arindam Bahel from Mumbai, offers a variety of small plates, entrées, and items from the tandoor oven. Most items are priced at a friendly 20 bucks or less. You can take a peek at the menu here. How about that wild boar from the tandoor or perhaps the spiced pork belly on paratha? I’m so there. There are also some modern Indian dishes, like deconstructed butter chicken. They will soon be open for a buffet brunch on Saturdays and Sundays, with a fresh juice bar, a clay oven station, and a variety of street foods. In the drinking department, there is a full bar, and I was lucky enough to sit down with bar manager Nirupana Srivastava and learn about how she has designed the drink menu, which you can check out for yourself here. The signature cocktails are all based around the Ayurvedic tradition, which is an ancient approach to holistic health that utilizes the herbs, spices, and other botanicals available in India to keep the body healthy. That’s right, the lemongrass and peppercorns actually make your Blessed Monk healthful. Or, at least, you can say they do and justify another round like it ain’t no thang. In addition to the signature cocktails, there are drinks based on American drinking traditions, a Latin section with margaritas and mojitos, and a pretty solid selection of beers by the bottle and on tap. There is also an extensive list of wines by the glass, which are international, and a reserve bottle list with all California options. You can check out both lists here. From 5pm-7pm every day is happy hour, which will include drink and food specials, but also an option for those of you looking to unwind without the alcohol: teatime! A traditional Indian tea service of loose-leaf Darjeeling will be available with snacks from 5pm-7pm every day. Tea will also be available on the regular menu as well, but the full afternoon tea service will only be available at happy hour. Hours are dinner Sun-Thu 5pm-11pm and Fri-Sat 5pm-11:30pm, brunch will be Sat-Sun 11:30am-3pm.